I finally went to Richmond last weekend. 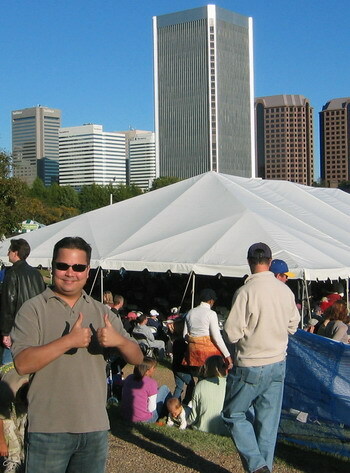 We went primarily to see the National Folk Festival, which is a traveling folk music event. We also had some great east-coast barbecue and saw a little bit of Adam’s home town. The folk festival was on for 3 days, but we were driving on Friday, so we only saw the last 2 days. Unfortunately, I didn’t change my sleep schedule in time, so I was extremely tired most of Saturday. This may have kept me from enjoying everything as much as I wanted to. On the other hand, I do have a long history of not enjoying live music performances unless I am really knowledgeable about the band and their music. Bottom line, I didn’t really dig Saturday all that much. Everything was annoying me, I got bored very quickly and I was tired for the whole day. For some reason, every other person kept on pointing out, “Hey, that’s the Federal Reserve Bank Shawn!” This is a picture of me with the Bank (The big steel building on the horizon). We eventually ran into a sign saying, “The building to the left is the Federal Reserve Bank of Richmond”. I mean, that’s annoying, right ? Near the end of the day, Monica Hernandez, from St Joe ’94 recognized Humberto and ran up to him. This was SO random. She moved to Richmond for a job with a bank. I have such a horrible memory, I don’t know if I would have recognized her. The next day was more enjoyable. I can’t decide if it was because I slept enough, the copious amounts of barbecue, or the shorter stay at the music festival, but it was a happy day. This might make it seem like I hated the festival, which I didn’t. I just can get my fill and be satisfied with maybe 2 or 3 hours worth. Not 8 or more. That’s not crazy, is it? Anyway, we went to 2 barbecue places, before and after the festival. We had vinegar based and sauce based. Several different sides. Just a plain ‘ol good day. Richmond reminded me of Boston in some ways. In the same way that Boston’s theme is the Revolutionary War, Richmond’s theme is the Civil War. No wonder the Civil War is such a part of Adam’s psyche. Now I wonder if it is such a big deal to all Southerners as it is to someone specifically from Richmond. I know it wasn’t such a big deal growing up in Texas, but then again, Texas had its own stuff going on with the Republic, the Alamo, and all that stuff.